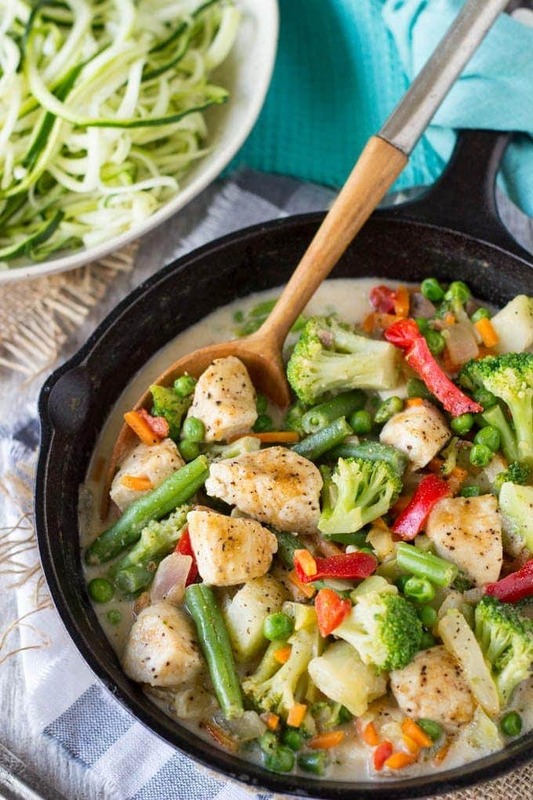 Creamy peanut sauce + Stir-fry Veggies + Chicken = Quick and Easy meal. Bonus, it only takes about 25 min. from start to finish to have this super tasty meal on the table. If you have a package of chicken (preferable boneless skinless chicken breast or thighs) some frozen stir-fry veggies, and a few pantry staples on hand you’re set to whip up this easy Peanut Chicken Stir-Fry. The recipe does call for coconut milk (the Thai version that comes in a can) but if that’s not something you have on hand you can easily substitute almond or coconut milk (the kind in the carton). I’m serving this Peanut Chicken Stir-Fry over zucchini noodles (because more veggies are always better in my book) but this would be equally as delicious over rice, linguine/spaghetti, ramen noodles, quinoa etc. Use packaged stir-fry veggies to keep this super simple or chop up any of your favorite veggies. As you can tell by all the “substitution” ideas…this recipe for Peanut Chicken Stir-Fry is highly customizable! So use your favorite veggies, give the sauce more of kick by adding more red pepper flakes/sriracha (or not), serve over zoodles/rice/pasta/quinoa. 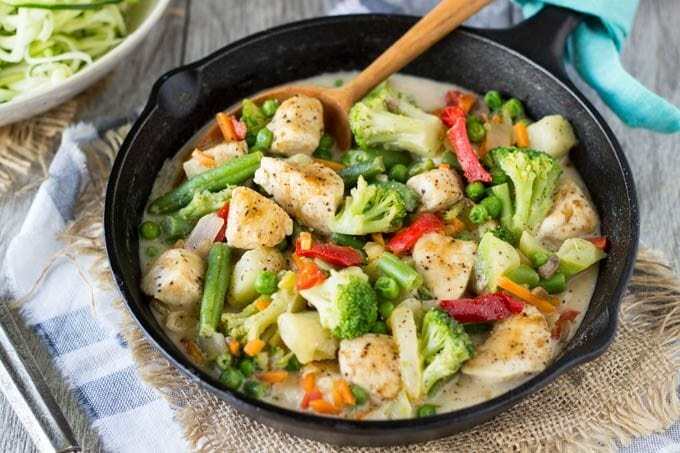 Anyway to choose, the creamy peanut sauce + veggies+ chicken is a winner for a quick and easy (and flavorful) meal the whole family will love. In a medium bowl, whisk together coconut milk, peanut butter, soy sauce, ginger, red pepper flakes and sriracha (to taste). Set aside. Season chicken with salt and pepper to taste. Heat a large skillet over medium high heat, add chicken and cook, stirring occasionally, until lightly browned (about 6 min.) . Remove chicken from skillet. 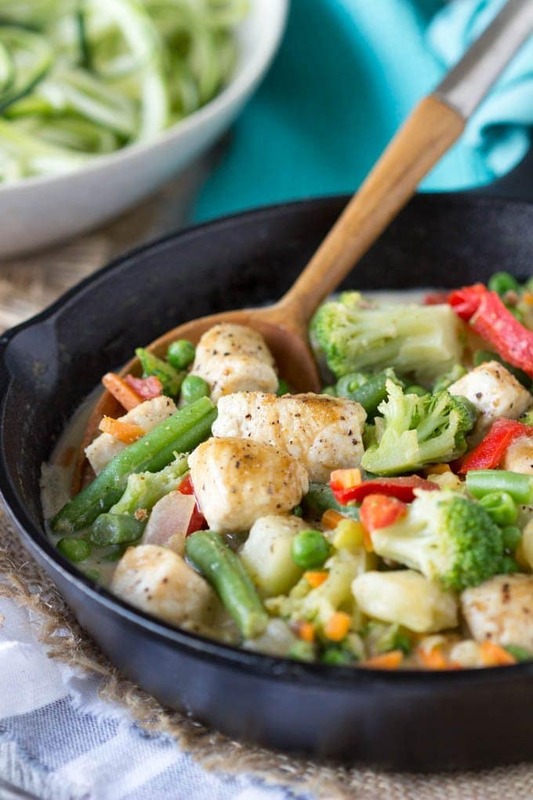 Add stir-fry vegetable and peas to hot skillet, cook until thoroughly heated (approx 2-3 min.). * more information on making zucchini noodleshere. If you dont have a spiralizer or julienne peeler you can use a regular peeler and make long "zucchini ribbons" or cut zucchini in pieces. ** This recipe makes a generous amount of sauce, use a slotted spoon to serve vegetables if you prefer less sauce.